Details: Charles Wood’s St. Mark Passion was written in the span of 9 days at the request of the Rev. Dr. Eric Milner-White (then Dean of King’s College in Cambridge and institutor of the Service of Nine Lessons and Carols at King’s). The St. Mark Passion, a large scale work soloists, choir and organ, traces Jesus’ last days from The Last Supper to the Crucifixion. As with Bach’s Passions, hymns are interspersed throughout the narrative to draw the audience into the action. Presented by the La Farge Ensemble. Details: You are invited to support former YOI Scholarship Winner Savannah Curro, performing her Senior Recital Friday evening, April 26th at 7:30 PM at the First Congregational Church in Winchester. Savannah is a senior at Arlington High School and began her organ studies in high school and is currently the church music intern at Parish of the Epiphany in Winchester. Savannah is finishing her college auditions where she is pursuing BM programs in organ performance to eventually become a full-time church musician. Details: The Board of Trustees of the Methuen Memorial Music Hall, Inc., are pleased to announce a FREE Children’s Event, which will feature organist, Leonardo Ciampa. In addition to the free performance, the event is holding a story writing contest for children ages 12 and under. The Board is looking for stories to be submitted on or before Sunday, April 14 and can be submitted to MethuenOrganConcerts@gmail.com. Submissions should aim to be 500 words or less, and can be submitted in English, Spanish, or Italian. Submissions should include the writer’s name and age, along with a parent’s name and contact number. Winners of the contest will be selected and contacted by Monday, April 22. The winning stories will have music composed around them by Leonardo Ciampa and will be read and played during the event. Doors will open at 9:30 A.M. Details: All concerts are free admission, with a suggested donation. For full details, visit http://www.reddoormusic.org. 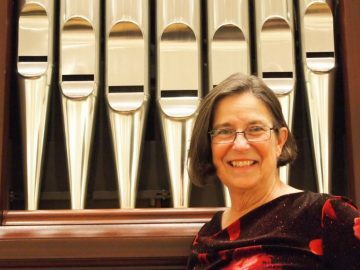 Sunday Baroque host and flutist Suzanne Bona, along with pianist and internationally recognized music educator Brenda Moore Miller, will perform a varied program of music for flute and piano on Saturday, April 27 at 3pm. Sunday Baroque began in September of 1987 as a local, 90-minute radio show hosted by Fairfield, CT native Suzanne Bona. It has since grown into the enormously popular, 6-hour program that airs every Sunday on WSHU…and which is distributed to 170 stations across the country and heard by more than a quarter million listeners nationwide. Details: Experience the incredible improvisation of world-class concert organist, George Baker, on the “overwhelmingly breathtaking” E.M. Skinner Organ. Join us on Sunday, April 28 at 3:30 p.m. at the Church of the Transfiguration, Cape Cod, MA. Details: Permelia will perform on the three manual 1892 Johnson and Son Organ, Opus 781. The eleven compositions will span four centuries of French Organ music. Details: All concerts are free admission, with a suggested donation. For full details, visit http://www.reddoormusic.org. Back by popular demand, the Pipes Alive! series continues with Jackson Merrill playing the St. John’s organ on Sunday, May 5 at 12:30 p.m. Jackson is organist and choirmaster at Trinity Episcopal Church, Hartford. Join us for half-hour organ concerts featuring St. John’s magnificent Austin pipe organ, on the first Sunday of the month, January through June, 12:30 p.m. with regional organists. Free! Details: Carson Cooman performs a recital of contemporary organ music by Thomas Åberg, Burkhard Mohr; premieres of new works by Flemming Chr. Hansen and Lynn Trapp; and a performance in honor of Yom HaShoah (Holocaust Remembrance Day) of Andreas Willscher's Organ Symphony No. 1, "Gravestones." Details: The Austrian composer Anton Bruckner may be best-known for his symphonies, eleven immense orchestral works that are vast in scale and dimension. But in his “day job” as an organist and choirmaster, he composed a wealth of exquisite sacred music for his choirs at Sankt Florian monastery (where he had been a choirboy in his youth) and at the cathedral at Linz. His ethereal Mass No. 2 in E minor, composed in 1866 to celebrate a new chapel in the Linz cathedral, is scored for eight-voice mixed choir and a small group of wind instruments. This Mass, widely acknowledged as among Bruckner’s best works, evokes the cathedralesque musical architecture of the Renaissance masters overlaid with the rich harmonies of the nineteenth century. The program also includes a selection of motets by Bruckner and others. Tickets $10-$40. Details: Yale University's brilliant young organist Nathaniel Gumbs plays an organ recital of diverse works on Trinity's Noack organ. Details: Come to the traditional ancient service of sung vespers! The event will take place, Wednesday May 8th at 7:00 pm! It will be sung by the St. Mary’s Youth Choir and is free and open to all. Details: Members of Boston Organ Studio perform varied repertoire on the famous C.B. Fisk organ in Old West Church. All are invited; Free admission. Details: During the early baroque period, German lutenists embraced the new French baroque lute and its lyrical, expressive (yet intimate) musical style, but by the 18th century they had developed their own tradition – a much more outgoing kind of music. Timothy Burris and Olav Chris Henriksen will begin their concert with Johann Gumprecht’s French suite, then continue with Radolt’s musical experiments for two lutes, followed by a partita by Telemann. The concert will conclude with music in galant/early classical style, exemplified in sonatas by Corignani and Hagen. Of special interest is a recently-rediscovered concerto for two lutes by the great Silvius Leopold Weiss. Come hear the beautiful and seldom-heard sound of two baroque lutes together! 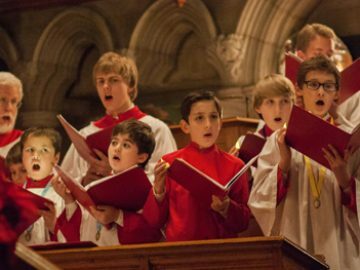 Details: Help launch the Trinity Choirs on their August tour of the United Kingdom, where they will serve as choir-in-residence at Wells and Salisbury Cathedrals. This concert will feature works by American composers – Amy Beach, Joseph Jennings, Roland Martin and Richard Webster – as well as beloved classics from the English repertoire – Herbert Howells, Ralph Vaughan Williams, William Walton and Charles Wood. Details: The combined singing forces of Christ Church present a wide-ranging program in celebration of the 125th Anniversary of its choral program, including selections by Byrd, Getty, Howells, Parry, Rutter, Schutz, Stopford, and Vaughan Williams. 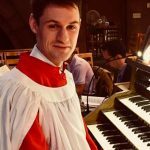 Robert Potterton III (Organist-Choirmaster) will accompany on the 1928 III/67 Skinner-Moeller organ; the Rev. Carolyn G. Jones will direct the Children's Choir. Details: Alchemy, the vocal chamber ensemble of the GMChorale, offers a series concerts that often feature collaborations with local ensembles and performers. Now in its third season, and led by founding director Joseph D’Eugenio, the ensemble, known for its ability to adapt its sound to a broad variety of repertoire, took the name \"Alchemy\" in recognition of the ancient, mystical art of creating gold through transformation and refinement. Already recognized for its vocal beauty, richness, and subtlety, this 24-voice ensemble brings a touch of gold to interpretations of Romantic and contemporary choral music. This season’s concerts, called \"Come to the Music\" features a cappella and accompanied choral music by Schumann, Brahms, Bruckner, Duruflé, Fauré, Siegfried, Vaughan Williams, Britten, Thompson, Vierne, and Clausen. Allan Conway accompanies. No tickets are required; a free will donation will be accepted. Details: Cited by The American Organist magazine as infusing his music with “virtuosic flair and fire,” Scott’s performances bring a unique emotional and spiritual inspiration to his audiences. Listeners find a place of solace, a time of wonder and awe. His playing has been described as inspiring, uplifting, powerful and flawless. Details: Since winning the Albert Schweizer Competition, American organist Christopher Holman has performed on some of the most important historic and modern organs in Europe and North America. As a guest artist, he has most recently appeared at the BachFest Leipzig, Festival international de l’orgue ancienne in Sion, Switzerland (the oldest organ in the world), and the Eastman Rochester Organ Initiative. He has released two recordings, and his performances have been broadcast on German and Swiss national television and radio. Also active as a scholar, his research has most recently been published in Oxford University’s journal Early Music, and he is Editor of the journal Vox Humana and Director of Musicology for Bach Society Houston.